Jane is a young archaeology student who`s gone missing. In the midst of a stormy downpour, you must embark on a journey to find her through an enigma of portals. A map inside an attic reveals a door containing fragments and Match 3 puzzle pieces. Highlight tiles under the artifacts to reveal clues. 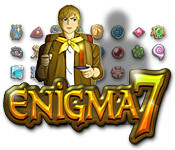 Can you match four or five tiles in a row and max out the power meter in Enigma 7? Solve puzzles and find Jane! 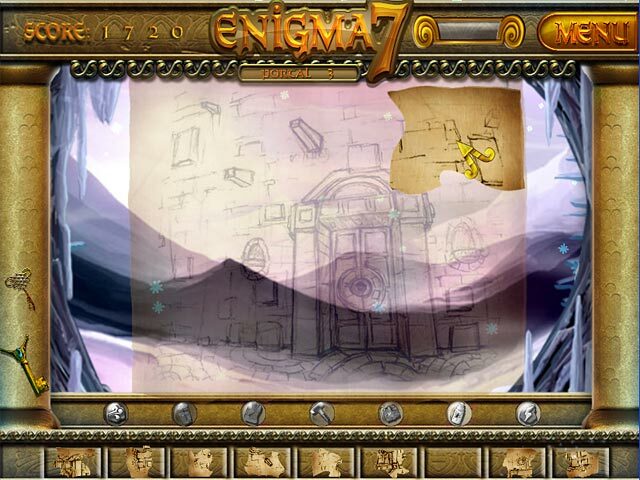 Enigma 7 is rated 3.5 out of 5 by 4. Rated 4 out of 5 by myyorkies1994 from A Good Match Three This is a traditional match 3 based on a door that closes behind you and opens 7 portals, each will produce a key. 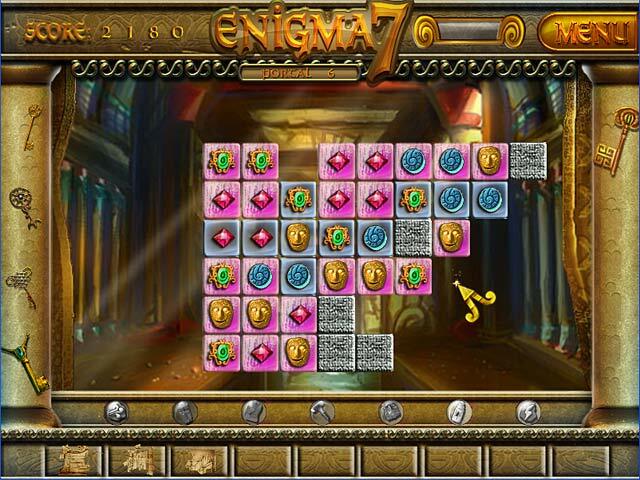 There are nine game boards in each portal and you earn a puzzle piece with the completion of each board. 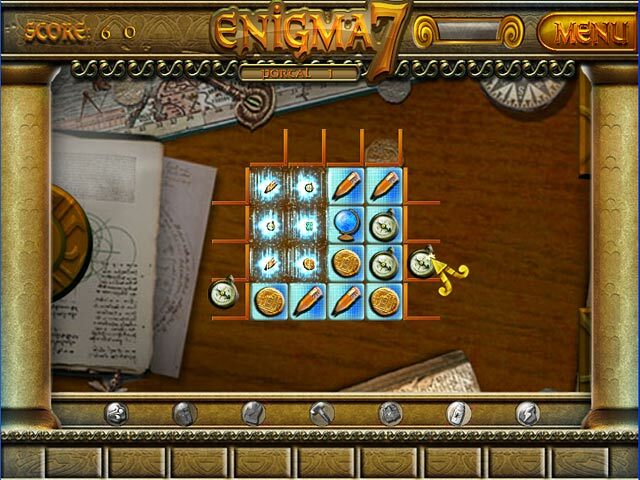 At the end of the nine boards you assemble the puzzle pieces to complete the portal. The icons change with each portal. The down-side is that this swap game doesn't support 'drag and drop' technology, the movement of the icons is slow, and you can't make another move until the entire boards settles. The board configurations get more challenging and the power-ups become more plentiful. In portal 2 there are solid blocks in the board that you have to work around, and you can move any icon into the blank spaces created below them. This makes the game play a bit more strategic! The timer is just about right, but I did time-out in once in the first 22 boards I played during the 1 hour trial. There are 7 portals, some reading in between and a puzzle at the end of each portal. In 1 hour I completed 2 full portals and 4 of the 9 games in the third portal. With increasing difficultly this entire game can probably be played in 3-4 hours. It is relaxing and colorful, with a good soundtrack, and it follows the storyline. I'm interested to see where it goes! Rated 4 out of 5 by buddymolly1264 from Fun 3 match some of it was a little hard, but fun. Rated 3 out of 5 by ldzach02 from flawed This is a regular match 3 game which I usually enjoy except this one has a few flaws. When you run out of matches on a board it doesn't automatically shuffle the board or tell you that you are out of matches. It also doesn't have a restart button to restart the level. The only way I could get beyond a board with no matches left is to shut down the game & restart the game to restart the level. It is also a very slow moving game in that it takes time when you to complete the level to put up the statistics & go to next level. When you get to the next level the board is already up there but you have to wait for a door behind it to close & open before you can start matching. It seems like a long time. Rated 3 out of 5 by kirragirl from So-So It was OK. Enough to hold my attention, I guess. But by the end of the trial, I was ready for it to be over. Guess there just weren't enough different things to do.